Mindfulness is ‘bringing focused attention to the current moment’. Whether that is making a cup of tea, running, playing tennis, or sitting quietly and meditating. When you participate in an activity in a Mindful way then you are present and experiencing everything. The act of running when done Mindfully connects you to your body in a meaningful way. We are not our thoughts, we are not only a brain, we are a complete unit. Body and brain are one. Making that connection enriches every moment of our lives not only the times when we are consciously being Mindful. There are some simple things you can focus on to bring Mindfulness to your running. Pay attention to the inbreath followed by the outbreath. Is your breathing synchronized with your steps? Is your breathing deep or shallow? Where is your head in relation to your shoulders? Are your shoulders above your hips? Where are your hips in relation to your landing foot? How are you feet landing? Notice the big toe. Is it landing first , last or at the same time as the heel. What does the big toe do during the entire time from landing to take-off. Is your landing foot far ahead of your hip or does it feel as if it’s right below the hip as it takes the weight of your body? Are you carrying tension in your body that is not adding to your running? Are you clenching your jaw? Are your shoulders relaxed? What about your hands, clenched or loose? How are your arms swinging? The way to practice Mindfulness in anything is to focus your attention on the thing you’re working on. Notice what is happening, don’t make any judgments, simply notice the sensations and thoughts that pop into your head. Examine them and then let them go with no judgement. Keep bringing your attention back to your focal point. Keep the practice time short in the beginning. Start with 3 minutes initially while running Easy. Build that up as you get better at the practice. The initial practice is simply noticing and this is all you want to do for the first 12 or so runs. The next step is, having noticed what is going on, to decide whether any action is required. Some thoughts might seem important but require no action or the action might be to re-evaluate later. Whatever the outcome the sequence PAUSE, BREATHE, THINK, ACT will put you in a position to best respond to the thought. Acting in this way you avoid being reactive and you become proactive. You are in control rather than Mindlessly reacting. Practicing Mindfulness will help you realise just how true this statement is. Thoughts that come to you are bits of information, they are not the reality, what you do with the information is entirely up to you. There is a physical reality and an internal reality. The mountain in front of you will remain in front of you if you get paralysed by the size of it and sit down. Big climbs will always be tough but using your Mindfulness skills you pause, take a deep breath and recognise that the fear is simply a thought, you want to get to the finish line and the only way to do that is one foot in front of the other. Soon enough you’re half way up and then over. 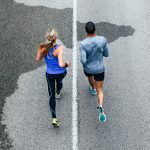 Remaining Mindful during a run will not only keep you focused on your form, which translates into better efficiency and so less energy , it will also allow you to monitor and respond to the signals you’re getting from your body. One cue that I use is a stumble. If I stumble I acknowledge that my pace is too high. I immediately slow down a little and start a full body scan. Am I hydrated, how are my muscles feeling, was the stumble due to a lack of attention or genuine fatigue? I address what I think was the cause of the problem and continue with the run. Another thing I check regularly is excess body tension. I check my jaw, if I’m clenching my jaw at all it usually means my upper body is too tense. I start at my jaw and relax the jaw, relax the shoulders, check upright posture, relax arms, relax hands and continue. Hearing my pulse pound in my head on a big climb usually means I’m going to hard and need to slow down. All of these, recognising fear for what it is, paying attention to your physical state and responding appropriately are made easier by a regular Mindful practice. Being Mindful is a skill and the more you practice it the better you get at it. The better you get, the more able you are to deal with adverse conditions. You are also able to get the very best from your body under all circumstances. Being Mindful creates a rich and authentic interaction with the environment. You smell the flowers, feel the breeze , notice the beauty around you and interact directly with the people you are with and encounter.